The following is an essay by Rev. Dr. James McLeod, Jr., in which he considers the impact of the writings and witness of the Buddhist Monk, Thich Nhat Hanh, who is entering the final days of his life. McLeod discusses how he first arrived at one of Nhat Hanh’s several books, Living Buddha, Living Christ, the way it was received during a difficult period of his life, and the relevance of Nhat Hanh’s wisdom for the 21st century. Dr. McLeod’s full bio is below. 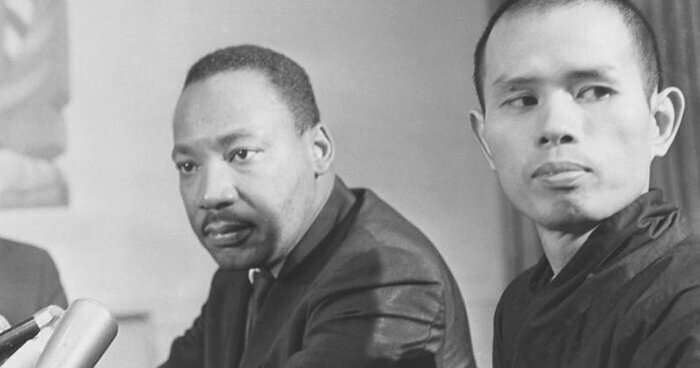 (Photo: Unknown) Thich Nhat Hahn and Martin Luther King, Jr.
Thich Nhat Hanh is dying. Not in the manner that we are all slowly dying, like grains of sand slowly passing from one end of the hourglass to the other. Rather, I mean that Thich Nhat Hanh is actively dying. In an article on the website for Time Magazine posted a few days ago, the author describes Hanh as no longer receiving medical treatment for a stroke he had in 2014, such that he is now entering the active dying process. In a villa on the grounds of a Buddhist temple in Vietnam, his ancestral and spiritual home, the 92 year old monk now spends nearly the entirety of his day. Robbed of the ability to speak, he now sits in silence as individuals from around the world come to the former capital of Vietnam to pay their respects and to sit in the peaceful aura that surrounds and will soon envelop this monk who introduced much of the Western World to the Buddhist religion and the practice of mindfulness. Though it is not unexpected that 92 year old stroke survivors will eventually pass from this world and into whatever it is that comes next, there was, at least for me (though I imagine others, as well), a sense of permanence to Hanh’s presence—something of his individual personhood that seems to transcend the bounds of time and space. I have to smile a little bit at this feeling because it is the practice of holding on to the finite that Hanh would no doubt have gently chided any of his followers for participating in. As a final reminder of the impermanence of everything, drawn upon parchment in a picture frame above his bed—a piece of art created by his own hands that will outlast the physical parameters of his own existence— is the the word “Returning." In the coming weeks and months, as that which is inevitable for all of us returns Hanh to the ground of his being, there will be obituaries and other essays by persons far more connected to him and his story than am I. And while I know most of the major chapters of his life—his childhood, his taking the Buddhist vows at 16 that would start him on the path towards being a monk, his time teaching in the United States, his return to his native land to protest the Vietnam War, his friendship with other spiritual luminaries of the 20th century (Martin Luther King, Jr. and Daniel Berrigan, to name two), his expulsion from Vietnam and his settling down in his adopted home in France, his writing of 71 books and his speaking around the world, his founding of Buddhist Centers throughout the west, his own beloved retreat center, Plum Village—there will surely be reflections and remembrances by those who were closer to Hanh that will do a much better job of honoring the legacy and life of the man than I could possibly do. This essay is not that. I cannot offer a firsthand accounting of a person that I have never met. What I can do is bear witness to the impact that he, his writings, his teachings, and his life have had on me and, I suspect, other Western Christians. And while I have no idea if this was his intention (though, as a side note, he did refer to Father Daniel Berrigan and and the Trappist monk Thomas Merton as his spiritual brothers), I can state, unambiguously, that his Buddhism made me a better Christian, a truth that I’d like to offer a few words to explain. I first encountered the writings of Thich Nhat Hanh at a particularly dark period in my life. I was in the second semester of my first year in seminary, and I firmly believed in nothing at all. One of the goals for the first year of matriculation at most institutes of higher theological education is a complete and utter destruction of what you thought you believed about God and God’s child, Jesus. And while that may have contributed to the loss of my own faith, that certainly was not the chief cause. 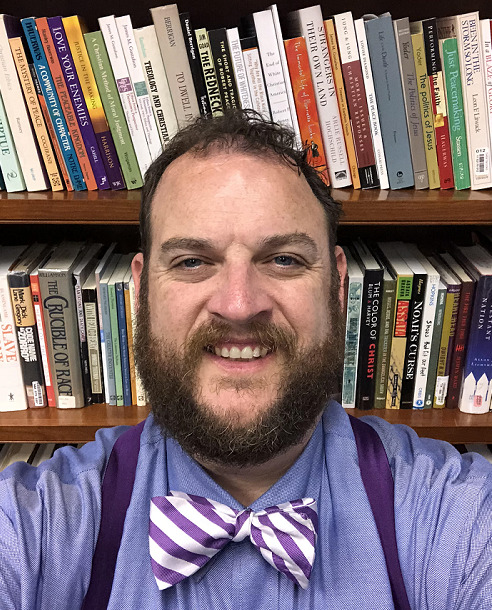 My personal faith had come crashing down scarcely a week into a summer semester Hebrew class, which occurred before the beginning of my first fall semester in graduate school. The Spanish mystic San Juan de la Cruz (St. John of the Cross) wrote in the late 16th century a series of poems and treatises that collectively came to be known as The Dark Night of the Soul. In it, San Juan notes the often harrowing experience of facing one’s own doubts and lack of faith against the backdrop of a metaphorical gathering eventide. For me, this metaphor came to life one evening deep into the night when I shot out of bed, covered in a cold sweat, realizing that whatever faith I had possessed when I had gone to bed had departed from me somewhere in the midst of a restless night of sleep. When I awoke, the darkness of the room and the world felt suffocating. Looking back to that evening some eighteen years after the fact, there is much that I can put into place to make sense of why that happened in the manner that it did. From San Juan de la Cruz to James Fowler’s Stages of Faith Development, most everyone who writes about spiritual (or human) development posits a necessary period of radical deconstruction if one is to reconstruct a faith (or life) that can stare down the bleakest of circumstances and still carry you through life’s trials. In my case, my faith had just imploded under the weight of its own self-assurance. This implosion was quickly followed by a chance re-reading of Elie Wiesel’s The Night Trilogy, a series about, among other things, the horrors of the German Shoah and the tragic and brutal loss of most of Wiesel’s own family. This combined with a wholly unsatisfying conversation I had with my then pastoral supervisor about the maintenance of faith even as one attempts to make sense of evil enacted on such a large scale. This reckoning washed any vestiges of my old faith out into the ocean. For the rest of that first year of seminary, I self-identified as agnostic. I don’t remember who first gave me a copy of Thich Nhat Hanh’s Living Buddha, Living Christ, nor why, in the midst of my falling into the darkness, I chose Buddhism to become interested in rather than any other faith tradition. Still, I knew I was flailing about, trying to reground myself on something, and that Nhat Hahn’s book was what my hand hit first. There are those times and spaces that remain indelibly marked in your brain—like a moment in which time and motion had stopped and your mind just clicked off several images for you to keep and treasure and never forget. So it is that I remember sitting on the floor, leaning against my couch in my little apartment in Louisville, pouring over the pages and feeling like each word had been especially chosen for my edification. Looking back, I can see that, for me, at least, the book could have been titled Calm Down: Why You Don’t Have to Have it All Figured Out at Once. Hanh’s writings felt like a ray of light that had come piercing into my darkened soul. Hanh’s style is peace-inducing in and of itself and his language sparse and simple. He takes the everyday, the mundane, the universal aspects of life and injects into them a degree of holiness and divinity that one could easily miss if she moves through life on autopilot. From washing dishes to drinking a cup of tea to peeling an orange, all of life can be seen and experienced as special, as beautiful, as holy, if we choose to slow down, breathe, and be fully present to the singular moment that we are given. 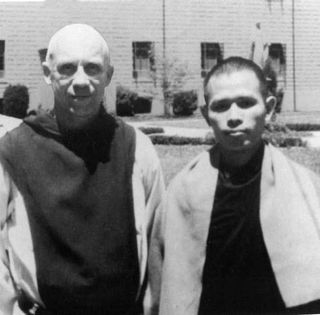 In Living Buddha, Living Christ , Hanh draws connections between Buddha and Jesus as if they were spiritual brothers, but he never has any interest in converting anyone to any particular religious tradition. For Hanh, if you are Buddhist, be the best Buddhist you can be. If you are Christian, be the best Christian you can be. Above all, just be mindful of the present moment in which you dwell because it’s the only one that you can be assured that you have. Nothing else in the future or in the past really matters. Moreover, don’t believe that you have to (or even can) figure it all out on your own. To use a Buddhist metaphor, the contours of one’s faith, not dissimilar to the dogmas and creeds of a single religious tradition, are merely fingers that point to the moon, they are not, in and of themselves, the moon. They can turn your head in the right direction. They can propel your life on the proper trajectory, but, at the end of the day, faith is much more about seeing the light of the moon and not the methodology by which you gained your vision. In the midst of the light of the moon, the pathway that one takes to get there becomes irrelevant. Words fail to express the degree to which just hearing those words lifted a huge weight off my own shoulders and began to take down the darkened curtains that I had placed all around my soul in order that no light could possibly enter. And it started me on a journey—a journey of re-exploration of my own faith and faith tradition. There is something incredibly freeing that arises when someone realizes for the first time that they don’t have to believe in any one particular thing. Moreover, you definitely don’t have to believe the same thing as your parents or their parents before them or their parents before them. Coming to this awareness was especially freeing for me. As anyone who knows my dad can imagine, my father casts a long shadow across the contours of the McLeod family. He is brilliant, well-read, intellectually curious and deeply religious. Growing up, it was my presumption that if he believed it then it remained in the realm of the unquestioned. And it was not until everything from the first twenty-four years of my life fell away that I could, with any degree of success, build something on my own that was not simply grafted off the tree that he had planted. Realizing that idea brought about an explosion of deep searching for a new truth, a new faith, a new spirit, and a new religion. I found myself no longer limited to a certain tradition or even a singular religion from which to imbibe. A world of exploration opened up to me, and it felt like what I imagine early explorers such as Amerigo Vespucci or Vasco de Gama must have experienced. I had climbed on a boat and I had pointed my sail in a general direction but had no idea where I was going or what I might find when I got there. In little time, my school library became my second home as I pulled book after book out of the stacks to read and ponder—Paul Tillich one night, Thomas Merton the next, John Calvin, then Sogyal Rinpoche, Ken Wilber, and Daniel Quinn. Things I hadn’t read before felt like wisdom was flying off the page. Things I had, felt alive and new. And it all started because of a chance encounter with a tiny little book written by a diminutive Vietnamese monk whose presence cast light into my dark night and whose peace gave me faith that I might one day find peace again. The freedom that I experienced following that first encounter with the writings of Thich Nhat Hanh materialized in such a way that my faith could better accept challenge, difference, disagreement, and the infinite shades of gray that existed between the fingers and the moon. This freedom led to a degree of peace that almost felt contagious. Just as I felt a deep-seated peace within my soul, so, too, was I drawn to peace-filled relationships with those around me. In the midst of this time, I realized the chief way (and perhaps the only way) to overcome all the walls of difference erected by cultural norms and stigmas was to see over and past all of those incidental markers of personhood and perceive the spirit of Christ in my midst in each person. Thus, Hanh states time and again, true peace arises in any context when people can begin to accept one another just as they are. For instance, Buddhists talk about seeing the Buddha spirit in one another, and Christians talk about the Christ in me greeting the Christ in thee. Nonreligious folks talk about recognizing the value and dignity of fellow human beings. In any case, it is that awareness of dignity and worth that prevents one person from hating another, from dehumanizing his neighbor, from denying the needs of the person sitting next to her. In Thich Nhat Hanh’s last dharma talk (Buddhist reflection) that I listened to, he discussed the process for making peace within one’s self, and then taking that peace out into the larger world. He told of a time in which he brought a group of Palestinians and Israelis to Plum Village, his retreat center, to spend some time together. When first arriving, the two groups were wary of one another because they had spent their entire lives being taught that the other could not be trusted. Over the course of ten days together, with Hanh teaching them techniques for deep listening, they really began to hear the other in their midst. They saw that their suffering was mutual and shared. They saw something of themselves in the other. 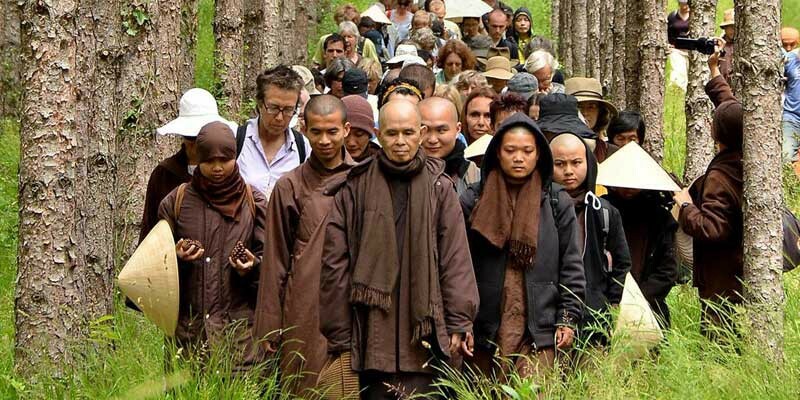 By the time the ten days were over, these two groups of Palestinians and Israelis were unified and shared the goal of going back to Israel and forming a Sangha (think a Buddhist church) so that everyone else in the country could practice this technique of deep listening and see the common humanity in the other. Our own country has recently exited the longest partial governmental shutdown that the nation has ever experienced. Virtually all of it arose because of a profound and dehumanizing “othering” of one side against another. The two political parties (who had just before the holiday break unanimously agreed to funding that would avoid a shutdown) spent much of the past month deeply entrenched in partisan battles. More troubling, though, was the degree to which all of it revolved around a racial animus first given voice to at the beginning of the campaign of President Trump that had, in the time since the Democrats had taken control of the US House of Representatives, reached something of a crescendo. The language about persons who had made the trek for thousands of miles from Guatemala, Honduras, and Nicaragua—largely mothers with their young children escaping gang violence and political instability in order to apply for asylum in the United States—had grown increasingly hateful and and dismissive. Women wearing ill-fitting t-shirts, carrying bedraggled looking children with bare feet and soggy diapers sliding half-off, unable to speak but a minimal amount of broken English, were declared a clear and present danger to the safety and security of the country. To make matters worse, claims, ludicrous on their face, that members of Al Qaeda, or any other radical Middle Eastern terrorist organization, were intermingling and hiding themselves within the group of (primarily) Latina women walking several thousand miles, added an additional degree of racial hostility towards the group. Depending on the inability of many Americans to distinguish between different types of persons with brown skin (or simply not caring enough to make the distinction), many declaring the emergent necessity of the wall adroitly integrated American racial categories with fears of terrorism and Islamophobia to garner support for a physical barrier. In short order, what began as a mnemonic device to assist a candidate in remembering to talk about immigration in campaign speeches had become a national policy desire for roughly 40% of the nation. It is for these times that voices like that of the Buddhist peace activist ,Thich Nhat Hanh, are essential, even if they can sound quaint in their simplicity. The mindfulness and deep listening that have marked the foundations of Hanh’s understanding of “Engaged Buddhism” begin to plant the seeds of both resistance against injustice and an active implantation of love and peace in a world sorely in need of both. With Hanh’s methodology, the onus falls solely on the practitioner to embody the deepest principles of Buddhism (principles that are largely found in most of the great Western religious traditions, as well). This is done with the belief that seeds of goodness that are planted in one moment have the opportunity to blossom in the next. Separated from power structures of government and their perpetual allure of corruption, the work of bettering the world begins with a deep inner-peace that slowly expands from each person. Motivated by every person’s right to move towards enlightenment unencumbered by systems of oppression and injustice, Hanh’s Engaged Buddhism sees the inherent dignity and worth of every person. This understanding is mirrored in Christianity by the declaration that we are all children of God, worthy of each other’s love and acceptance. Apart from these core beliefs, both Buddhism and Christianity are denuded of any spiritual power or relevance they might otherwise have as we settle into the contours of this 21st century. I find myself mourning the impending loss of such a spiritual beacon in my own life. It is rare that you find the religious leader who teaches you to calm down and not worry so much about the larger questions of faith and God and life. His writings, his teachings, and his presence gifted me with the space to let go of some of the edifices that I built around me over the first twenty-five years of my life and to move into a time when I could experience God - the Holy, the oneness of all - apart from any need to define it. For that, for his life, I will be forever grateful. More than that, though, I find myself painfully aware that it is his voice - the same voice that so courageously decried violence for violence’s sake in his native Vietnam, only to then be exiled - that is most needed in the world today - a voice that cries peace while others would “Cry ‘havoc’ and let slip the dogs of war.” It is a voice that constantly calls each of us to respond to hatred with love. It is a voice that singularly moves us back to our true selves, our true Buddha nature, our true embodiment of the Christ, our true unity. The entirety of his life bears witness to the singular reality of all creation—that we are all forever and always returning. And the quicker we realize that, the quicker we will find the peace that surpasses all understating.